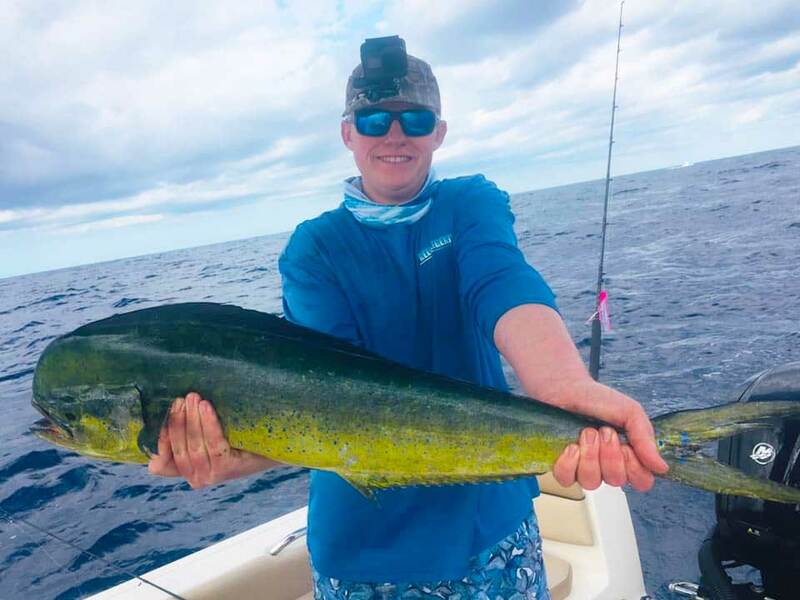 Mahi-mahi have been hit or miss this week. We got one peanut and trolled five hours. Because of how migratory mahi are and the fact that the Gulf Stream flows 4-5mph, the fishing changes daily. Trolling skirts and ballyhoo will catch them if they’re around. 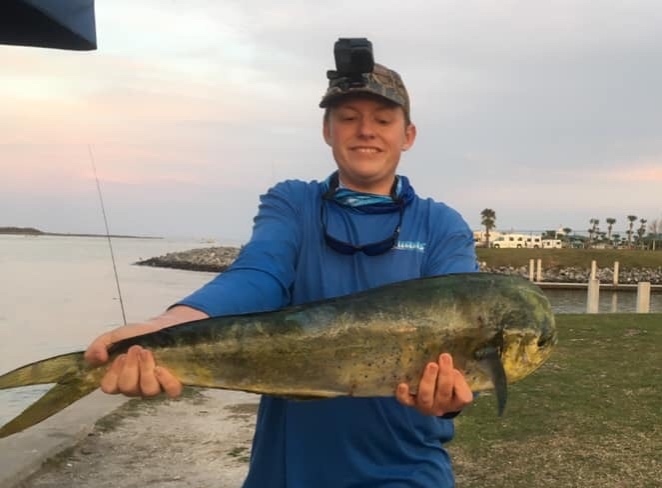 After an epic kingfish bite on March 25, we tried Pelican Flats again. There were red snapper and a few smoker kings up top, but they were very hard to get past the sandbar and hammerhead sharks. 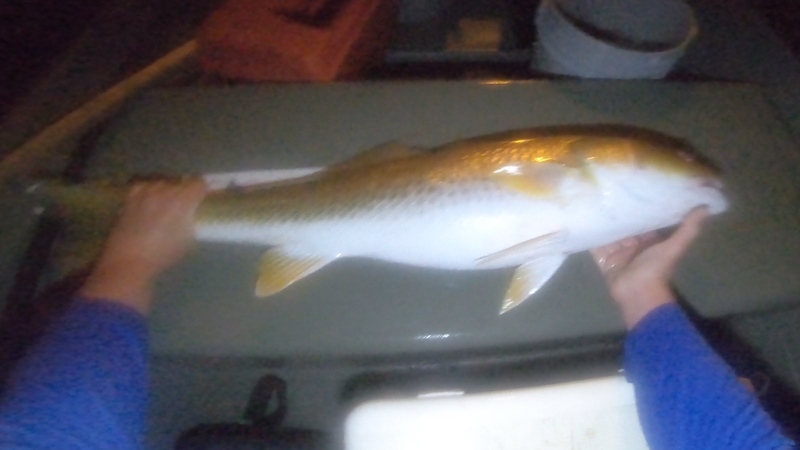 With the new moon and fairy clear water in much of the North/Central Indian River and Mosquito Lagoon, there has been a lot of 10-25 inch seatrout. 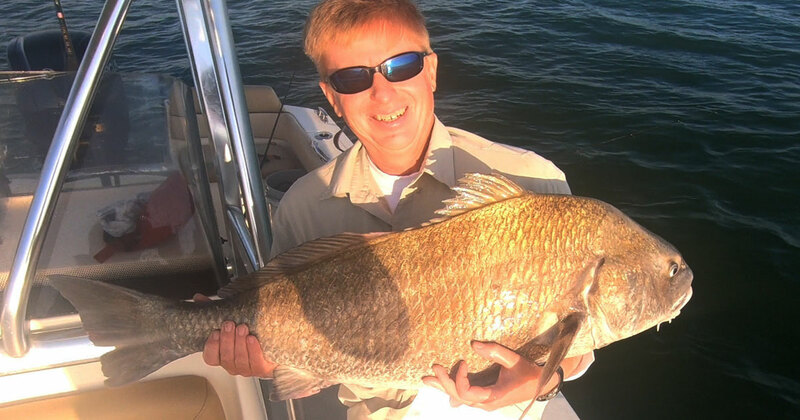 Look for flats with a seagrass, a good ledge, or baitfish. Trout are often also found in and near channels and canals. Sometimes I’ll see a big 20-30 trout or two while sight fishing reds in skinny water. Kings went from Zero to Insanity! 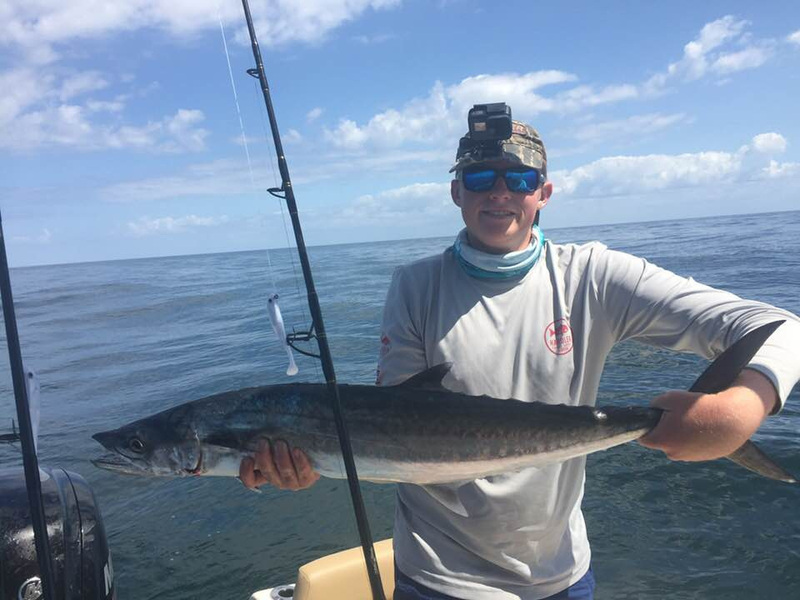 We caught at least 25 kingfish within five hours southeast of Port Canaveral in 80ft of water. We knew bait has been extremely scarce, so we left early didn’t even bother trying. We used spot-lock over a place I’ve done well before away from the fleet, which was on North Pelican Flats. We were going to tripletail fish out of Port Canaveral Saturday, but there were two or three boats on almost ever buoy by 7:00AM. There was a huge school of black drum off the beach. They would occasionally hit a shrimp. That meant using a smaller hook that could straighten. They turned off and went down by 8:30AM. This school of fish probably moved south with the cooler weather. If spotted, use medium to heavy spinning gear with large shrimp or crab. 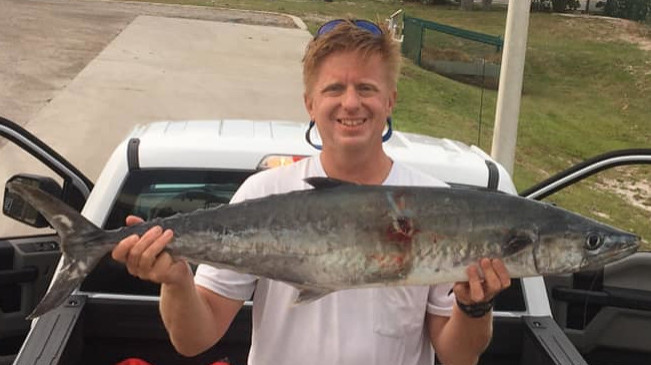 Sometimes, they will eat a cobia jig if you rip it through them out of defense. I went offshore out of Port Canaveral Friday Morning. For the first 20 miles it was fairly smooth. After a very red sunrise, we hit 15mph east winds and 3ft chop. 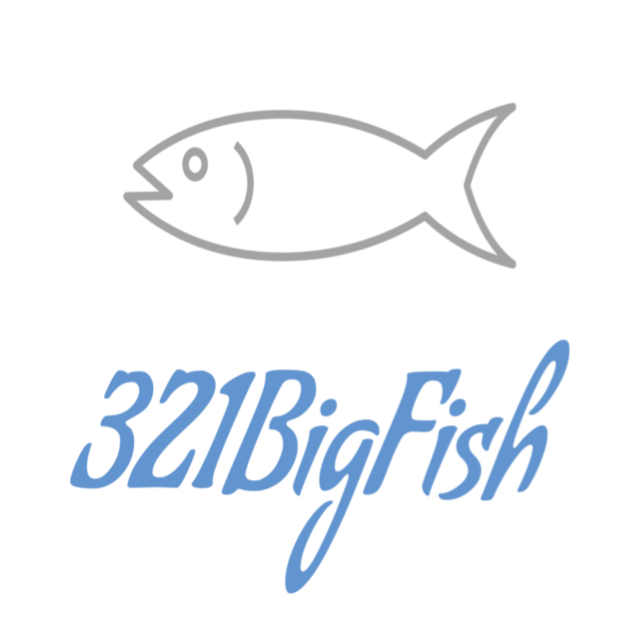 We tried amberjack fishing in 230ft. 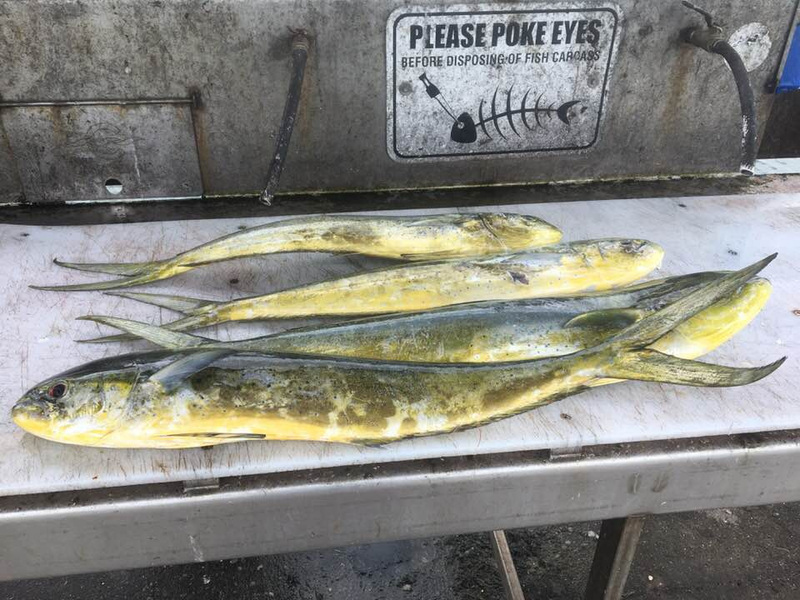 We marked them real good, but couldn’t get a bite. As we were getting ready to troll, scattered weeds drifted by. We went offshore out of Port Canaveral on Wednesday. We closely studied sea temperature charts and assumed that the water was too cold for cobia and tripletail. On our way out to troll, we stopped at a deep structure. We caught some small amberjack on vertical jigs. These fish were fun to catch on heavy spinning tackle. We used 50lb braid and a short piece of 80lb fluorocarbon. If the big amberjack are around, use very heavy conventional tackle with leader no less than 100lb test. Because the sea surface temperature was only 68°, there weren’t many sharks. We got offshore out of Port Canaveral Friday and had a great trip. We knew the day before that the water was really cold and dirty out to the at least 180 ft, so we planned on jigging a spot in the 200-250 range than trolling east. This was our first time adventuring this far out, so it was definitely a learning curve. I got to see an incredible sight last Wednesday. There were hundreds of bottlenose dolphin offshore they were jumping and playing right by the boat! Fishing was tougher and slower than normal. The water temperature was in the low 60s all the way to well past 100 ft. There were not even threadfins on the buoys. Somewhere around 125 ft we hit blue, 70-73 degree water. There was a lot of life but there were not any pelagic fish excluding baby bonito and a few barracuda.